Aerith is playing a cloud game! In this game, there are n clouds numbered sequentially from 0 to n - 1. Each cloud is either an ordinary cloud or a thundercloud. Aerith starts out on cloud with energy level E = 100. She can use 1 unit of energy to make a jump of size k to cloud (i + k) % n until she gets back to cloud 0. If Aerith lands on a thundercloud, her energy (E) decreases by 2 additional units. The game ends when Aerith lands back on cloud 0. Given the values of n, k, and the configuration of the clouds, can you determine the final value of E after the game ends? Note: Recall that refers to the modulo operation. The first line contains two space-separated integers, n (the number of clouds) and k (the jump distance), respectively. If ci = 0, then cloud i is an ordinary cloud. 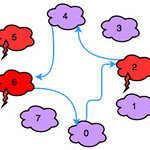 If ci = 1, then cloud i is a thundercloud. Print the final value of E on a new line. Move: 0 -> 2, Energy: E = 100 - 1 - 2 = 97. Move: 2 -> 4, Energy: E = 97 - 1 = 96. Move: 4 -> 6, Energy: E = 96 - 1 - 2 = 93. Move: 6 -> 0, Energy: E = 93 - 1 = 92. Thus, we print 92 as our answer. // if cloud num is divisible by k , subtract 1 as well as 2 if num is 1.